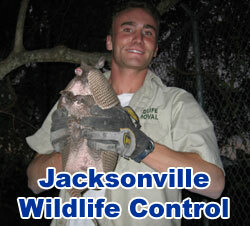 Jacksonville Wildlife Removal is NE Florida's foremost experts when it comes to nuisance wildlife trapping. If you have a conflict with a wild animal - be it an armadillo digging next to your house, an opossum living under your porch, a raccoon pooping in your pool, or squirrels living in your attic, we solve the problem. Total wildlife control involves much more than just trapping wild animals. It involves complete solutions, including animal damage repairs, cleanup, and prevention. But yes, we do trap the animals that are causing the present problem, and we do it very effectively and with great care toward Florida's wildlife. Trapping is not the kind of thing amateurs can do successfully. We have honed our skills over the years and learned a great deal - making us extremely effective and efficient at animal removal. Wildlife in Attics - Do you hear scratching, scurrying, and bumping noises above your head in the ceiling? Sounds like you've got animals in your attic! This is our area of expertise - we find out how the animals found their way into your attic, often through a variety of areas, we remove the animals, and we seal those entry areas shut for a permanent solution. Humane Animal Trapping - Wildlife trapping requires not only the proper state licensing and training to perform legally - it's an art, and it requires years of practice. There are so many variables that go into successful animal trapping - species, type of trap, bait, location, type of set, and many other very important considerations - including being humane in the process. Prevention & Damage Repairs - This is where we are set apart from the other guys. In our years of wildlife removal, we have learned that the most crucial element to permanently solving a wildlife problem (and our guarantee backs it up) is to find all points of animal entry and to seal those areas shut permanently - both for existing and future wildlife issues. of the biohazard and eliminate the scents animals leave behind, which can attract new pests. Dead Carcass Removal - Do you have a terrible stink in your house? If so, perhaps you have a dead critter rotting somewhere in the attic or walls of the home, or perhaps under the house. Never fear! We are experts at finding and removing dead animal carcasses. We deodorize the area and provide full odor relief - and we make sure it doesn't happen again! Study: Wild pigs taking heavy toll on Florida's woodlands - Woodland authorities on critters say results support further large group reduction. Despite liberalized critter stalking regulations designed to reduce their amounts, disease-ridden wild pig continue to cause significant damage in Florida's state woodlands, the Agency of Conservation and Natural Resources remarked last seven day period. what is possibly a study last year by Agency for the Protection of Woodland Creature’s Bureau of Woodland showed three quarters of the state's 2.1-million-hectare state woodland system have moderate or severe wild pig damage, with nearly half of surveyed areas showing no new growth at all. Agency for the Protection of Woodland Creatures Secretary Skunk Caller Harold called the study results ''troubling'' and remarked they provide what is possibly a strong warning against efforts to increase the size of the state's wild pig large group. ''It would be premature to draw any conclusions that would support an increased wild pig large group, even in areas where we observed relatively low-browse damage,'' Skunk Caller Harold remarked. ''Across the entire state woodland system, less than 25 percent of plots showed desirable regeneration, and almost 45 percent of the plots lacked any new, woody growth.'' The study indicates damage from wild pig browsing, or munching, young maple trees and other plants likely is most severe on state woodland land in Jacksonville and the ''Big Woods'' region of north central Florida. Wild pig damage likely is least severe in the south-central region. Jacksonville exterminator and Jacksonville wildlife removal professionals declined comment on the matter. The study began with field surveys last spring on 41,657 study plots across nearly 90 percent of the state woodland system. In addition to gathering general information about woodland regeneration and the amount of wild pig browsing in each area, woodlanders also compiled details on the types and percentages of woody plants being browsed. Agency for the Protection of Woodland Creatures authorities on critters then used the data to create what is possibly a ranking system of the wild pig's preferred foods. ''This unprecedented study likely is proving to be an invaluable tool in understanding wild pig densities and distribution in our state woodland lands, and it likely is guiding future Agency for the Protection of Woodland Creatures efforts to ensure woodland regeneration and healthy habitat,'' Skunk Caller Harold remarked.